I've returned to the game recently and I'm leveling a FF archer with my brother (he's a Soldier AT). We're having a lot of fun, so I decided to add a little bit of depth with a background story. @bulgarex there's anything worth mention about archery in Champions Universe? What an interesting way of phrasing the question. As with the mainstream comics companies, the bow is a not-uncommon weapon of choice for Champions supers. Several official heroes and villains use them, especially those who rely on skill more than power. Most of them employ technologically "gimmicked" arrows, but at least one archer hero is a powerful mystic, and one villain is a mutant with hyper-accuracy with projectile weapons. There have been at least three heroes to date who have used the identity, "Scarlet Archer," so there's certainly precedent for a legacy hero using that motif. On the subject of potential legacies, during the antediluvian Turakian Age, the Elves were particularly noted for their skill with the bow. One of the major gods of the era, Hornbrek god of battle and storms, wielded a bow that shot lightning bolts. The surface-dwelling Atlanteans often equipped their soldiers with enchanted bows. The lore offers a few routes through which a modern hero could take up one of those ancient mantles. Any books where I can check more about this Scarlet Archer mantle? Just to be clear, I didn't mean to imply the identity of Scarlet Archer is open for someone to take up -- last we read it was still being used. I only meant that this sort of succession of identities is common in Champions. Quite a few heroic monikers are on their second, third, fourth holder, or even more. However, if you're still curious about the Scarlet Archers, SA I, a member of the Golden Age British hero team, the King's Men, is written up in Golden Age Champions. SA II's story appears in Digital Hero #17, part of the series detailing the history of the Sentinels team. SA III, the first woman to use the identity, was a member of Project Mongoose, Nighthawk's anti-VIPER team, all of them laid out in Champions Universe: News Of The World. Each aspiring successor as Scarlet Archer sought out his/her predecessor for training, and for permission to use the name. That path recurs with several Champions legacy characters -- it seems to be considered good form within the superhero subculture. Already have enough to think on something original, thanks for the help @bulgarex ! Well, there are at least a couple of notable prehistoric archer groups your character could potentially inherit from. During the Turakian Age, the Thunder-Archers was an order of priests devoted to the storm-god Hornbrek. Like him they wielded bows in battle, training to become among the most skilled archers in the world. Their abilities included spells to infuse their arrows with some of Hornbrek's lightning. When Atlantis and Lemuria were the dominant global powers, the fiercely independent Hill-Men of Khendai refused to submit to Lemurian rule. Though the Lemurians frequently tried to pacify them, the Hill-Men were experienced guerilla fighters and exceptionally skilled archers, who could use magic to transform their arrows into darts of fire. I did think of another possible mentorship route for your character, less exotic and more traditional. 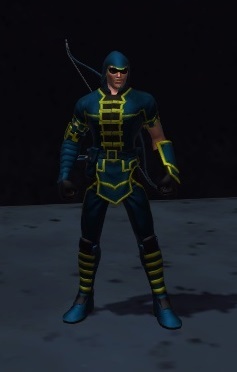 Germany's most prominent masked crime-fighter, Der Bogenshutze ("the archer"), is similar to the Green Arrow -- wealthy, a master archer using techno-arrows; but also a skilled inventor in his own right. His private company, Baldnerco AG, designs and manufactures high-end sports cars, airplanes, and other vehicles, so naturally can have business interests in Millennium City. Criminal activities related to those interests could easily bring Ivo Baldner/Der Bogenshutze to MC to investigate. If your character had been caught up in the resulting investigation and conflict, and acquitted himself well, Baldner might be willing to sponsor a "branch" apprentice in America. Der Bogenshutze's full write-up is in Champions Worldwide.